Self-propelled lawn mowers are an excellent way to make your yard work more enjoyable while saving some money. They simply push themselves, all you need to do is guide them to help control their path! Self-propelled mowers operate much like regular push mowers, except they work on a drive system that requires you to squeeze a bar on the handle. This will engage the mower and the drive mechanism, and from there on out it will move on its own. 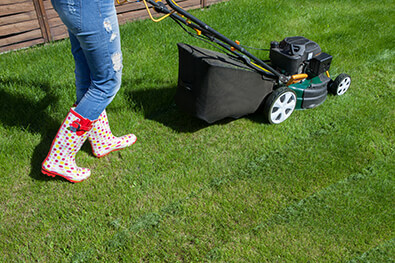 The strength requirements for cutting your grass are lowered with a self-propelled lawn mower. They are propelled forward by either rear wheel drive, or front wheel drive depending on the model. Some models even have front and rear wheel drive, making mowing on hills easier to accomplish as well. They are perfect for reducing fatigue, allowing you to have more energy for whatever else the day has in store for you. As we all know, traditional push mowers can be exhausting, especially for those of us who have property around the one-acre mark. Self-propelled mowers make cutting your lawn less demanding, and it is for this reason that the professional mowers utilize them to help with some of the extra work they may have on the job. In this article, we will review five of the best self-propelled lawn mowers of 2018. We will explore some of their features, the pros, and cons of each of the models, give you any model specific information, and even link you to where you can see them for yourself. This could help you make a more informed decision on what exactly it is that you need for your own yard work. OK, I’m sold on self-propelled mowers. Just take me to the reviews. Why Should I Purchase a Self-Propelled Mower Online? Several things should be taken into consideration when deciding to purchase your lawn mowers online or at a local dealer. The first of which, there are a wider array of options to choose from. When going to your local hardware store, you may notice that the options are few, far and between. If they do not carry what you need, they will simply order the item online themselves, then sell it to you at a markup price. This brings me to my next point, that shopping online is cheaper. Many times, you can find the deals online, and this is what is great about living in the 21st century. In today’s day and age, we have to find every opportunity to save money where we can, and purchasing your mower online can help you to achieve this goal. Another great reason to purchase online is the ease of ordering and shopping. All the information you need is right there at your fingertips, and there are countless resources on the internet that can help you to answer any questions you may have. You also cut out the salesmanship, as honest reviews placed by customers who have purchased the mower you are interested in are available. What Should I Look for in a Self-Propelled Mower? Self-Propelled mowers have all the great features previously mentioned, but what you are really looking for is longevity, capability, and ease of use. You’ll want to make sure any mower you choose has a mulching option and comes with a detachable bag for catching grass clippings. I have wanted to get around to posting an article on the benefits of mulching and bagging but haven’t gotten around to it yet. The short of it is that you aren’t helping your lawn by letting large clippings pile on your lawn. You need to either bag your lawn clippings for composting/removal or you need to use the mulching attachment so any clippings are very fine and break down easily. 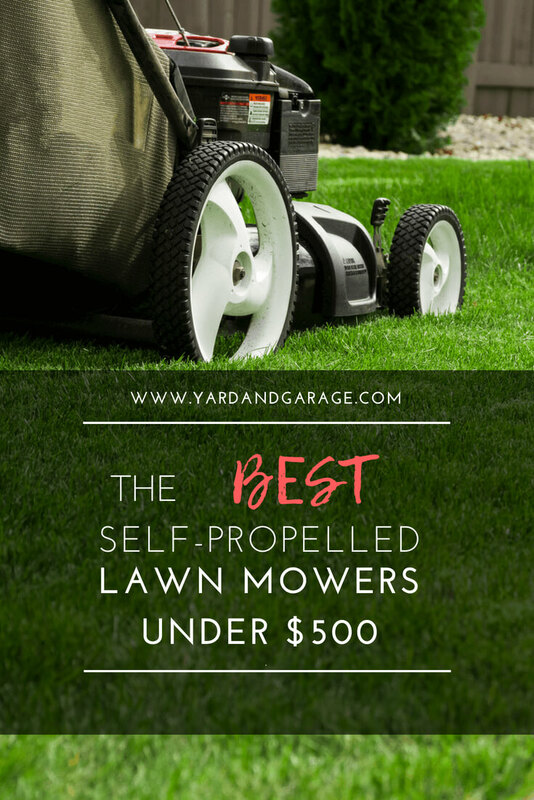 Self-Propelled mowers are a hot ticket item for many homeowners, and they easily fit in a garage, shed, or wherever it is that you plan on storing them. They are smaller than riding mowers, making it easier to keep in your garage and still have room for your vehicle, and working areas. This 159cc engine is what drives the mower. It features a 3-in-1 mulch, collection, and side discharge options. It has a 21-inch steel cutting deck, allowing for ease of cutting your grass. The rear wheels stand at 12″ high, and the front wheels are a smaller 8″ high. A soft grip handle makes for a comfortable lawn mowing experience. There is a chokeless and primeless start feature on this mower, allowing for first pull startup. Ease of pull is another nice feature on this model. First start up may take four or five pulls, but after that, the mower typically starts first pull every time. The cutting power of the motor may not be sufficient for heavy duty jobs. The Honda HRR216VLA self-propelled gas mower with electric start sits at the top of its class. Mulching option is available, and it has micro cut twin blades to ensure a precision cut experience. This model also features a variable speed control lever, allowing you to change the pace to fit your comfort. This is an electric start mower, using a special 12v battery. Pull start is also available, but who would use it? The mower features great maneuverability around corners and sports a rear wheel drive. The mower is built to last, with longevity being a major highlight of the product. The Honda engine lives up to its reputation, providing excellent power, and drive capabilities to ensure a quick, easy, and painless lawn mowing experience to the customer. Packaging is well-done, helping prevent damage to the product during shipping. Motor is fully assembled on arrival, with oil in the box, making the initial set up process a quick and easy process. Multiple cutting height setting for the mower, making it easy to discern height of grass for each cut. Easy Start up, user friendly. Some users have reported to tighten the wheels before first use. The Troy-Bilt TB330 163cc 21-inch 3-in-1 Rear Wheel Drive Self-Propelled Lawnmower is powered by a 163cc Briggs and Stratton engine. It is equipped with a 21-inch TriAction cutting system and has an integrated premium deck wash.
A single lever variable speed drive control feature makes switching up your pace easy, quick, and efficient. There are four top speed settings for your comfort and control. This model features 3-in-1 side discharge capabilities, mulch, or rear bag, and has a 1.9-bushel capacity bag included in the packaging. 8 by 8-inch-high performance wheels and an adjustable ergonomic handle make this mower easier to use. This mower is built to last, and some of the features such as the previously mentioned deck wash help to ensure a longer life for this product. The wash port makes cleaning the mower easy, and can effectively lengthen the life of the mower by keeping it free of debris, and less likely to clog the mower with each new use. The manufacturer guarantees that the engine does not require an oil change, all you do is add new oil when the time comes. The Troy-Bilt TB370 163cc 21-inch In Step RWD Self-Propelled Lawn Mower has a 163cc Briggs and Stratton engine, and a ready start choke system for easy start up. This mower also features a 21-inch TriAction cutting system, 6 setting adjustable height preference, and a 3-in-1 side discharge, rear bag, or mulch option. You can remove the blade from the adapter to test balance. This mower is backed by a two-year limited warranty. This mower is very easy to set up and works great on initial use. The user-friendly model comes with a manual, one-pull startup, and a large gas opening to help reduce spillage and create an environment-friendly experience. Runs smoothly, and easy to use. Needs blades tightened every few months. The Lawn-Boy 17732 21-Inch 6.5 Gross Torque Kohler XTX OHV, 3-in-1 Discharge Rear Wheel Drive Self Propelled Lawn Mower features a rear wheel drive system to ensure better traction and control on hills. The manufacturer guarantees a 3-year Tru-start commitment, stating it will start in one or two pulls, or Lawn-Boy will fix it for free. A two-point height cut system allows you to adjust the height of the mower. The model has a 149cc OHV engine. It is CARB compliant for the state of California. Easy to fill gas spout. Rear wheel drive ensures a power-driven experience. The height adjustment feature is on the side of the mower, and is not as easy to use as a lever adjuster. Assembly is not as easy as some other models. My choice for the best self-propelled lawnmower. These mowers are a great starting point for those who are looking for a good quality cut and easy to use lawnmower for their yard work. Each has their own unique benefits, some handling hills and corners better, while others feature better assembly, startup, and overall performance. 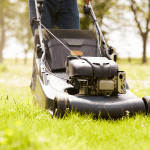 Many people who cut their own lawns may have their own personal preference on the features they require, but one mower, in particular, seems to stand out by having all the features one may need already built in. The clear-cut winner of the roundup is the Honda HRR216VLA. The value of the mower and its longevity make for an excellent investment for those looking for a strong performance they can count on throughout the years. It is no wonder why so many of the customers who purchased this self-propelled mower had many pros to highlight, with very few complaints. I have owned a slightly different model, the HRR2168VKA, which doesn’t come with an electric start, for over 5 years now. It is still running great after all this time and the next mower I buy will be a Honda as well.